The Crypto “Key Chain” – Eureka, Easy Wealth! Tom and Bill met daily during their lunch break at a nearby café. 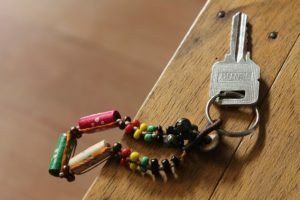 One day, Tom took out a colorful plastic key chain from his pocket and showed it to Bill, explaining that he had just purchased it at the flea market for $ 2. Bill was instantly taken by its beauty and insisted on buying it. Tom shrugged and asked for $ 5, which Bill happily paid and took the key chain. The next day, Tom missed his key chain and asked to buy it back. But shrewd Bill, asked for $ 10 and, with a bit of grumbling, Tom paid $ 10 and got his beloved key chain back. The following day, Bill offered to buy it at $ 15. Tom agreed and, for the second time, parted with his key chain. But the day after, He bought it back for $ 20. This went on for over month until the price of the key chain rose to $ 170 ! Then, one fine day, when Bill asked to buy the key chain, Tom declined, explaining that he had sold it 10 minutes earlier at $ 180 , to a stranger at the café. And so, Tom and Bill restarted their daily trading activity using a newly purchased plastic key chain. But after a week of mutually satisfactory transacting, the stranger appeared and angrily threw his key chain at them claiming that he had been cheated and duped to pay $ 180 for a cheap $2 key chain, and asked for his money back. Tom looked up nonchalantly, and replied: “This is a free market. The going price was $ 180 when you bought the key chain. Todays’ price is $ 35 , we would be happy to buy it from you at that price, or sell you our other key chain at $ 35”. Fuming, the stranger realized that he had no choice, and to cut his loses, he reluctantly sold them his key chain for $ 35 and walked away. However, he returned after a few minutes, smiled apologetically said: “I have given the matter some thought, and since I have lost money in this transaction, I figured that I may be able to recoup some of my losses by joining your trading group. Can I? Please?” And thus, Jim (the stranger) became the third member of the group and they happily traded the two key chains amongst themselves. In a couple of weeks, the café clients on the nearby tables got wind of the booming mini trading market next to them, and asked to join in on the action. A month later, not only were all the café’s customers trading, but others from nearby cafés and shops had joined in. With so many people trading only two key chains, hundreds of daily transactions took place. And at a markup of $5 per transaction, the market price rose rapidly reaching, within a week, to $4600 per key chain! Then, one fateful day, a new customer walked in for a quiet cup of coffee, but soon noticed the bustle and din arising from the ‘trading floor” and asked what they were trading. He digested the information, paid for his coffee and left. He returned an hour later with 200 key chains and sold them to the hungry investors. Of course, dumping 200 key chains in the span of a few minutes, forced him to lower the price for each sale, reaching $ 400 for the last key chain sold. Nevertheless, he walked away a rich man. Suddenly, the market was flooded with key chains that no one wanted to buy, and the price crashed to $ 2 with no bids. Of course, like a pyramid scheme, the latecomers to the group were hit with huge losses and threatened to sue Tom and Bill, who had already hightailed it out of the café and were never to be seen again in that neighborhood. A few days later, a local newspaper reporter found the last trader who had dumped the 200 key chains and asked him to explain his ingenious trading philosophy that made him so rich. He shrugged his shoulders and replied: “Basic economics. The traded product had no intrinsic value or use that justified a price above $ 2. The shortage of supply faced with a rapidly growing demand fueled by greed rather than utility, pushed the price sky-high. It was only logical to grab the opportunity and quickly increase supply and rake in the profits”. الجشع هو الذي جعل من الوهم حقيقه بين السذج من الناس ومثل الذي يقول سلفني والاعبك!!!!? ?